It is the largest and most complex star forming region in the entire galactic neighborhood. Located in the Large Magellanic Cloud, a small satellite galaxy orbiting our Milky Way galaxy, the region's spidery appearance is responsible for its popular name, the Tarantula nebula. This tarantula, however, is about 1,000 light-years across. What's happened to the Sun? Sometimes it looks like the Sun is being viewed through a large lens. In the above case, however, there are actually millions of lenses: ice crystals. As water freezes in the upper atmosphere, small, flat, six-sided, ice crystals might be formed. What is it? It was found at the bottom of the sea aboard an ancient Greek ship. Its seeming complexity has prompted decades of study, although some of its functions remained unknown. Recent X-rays of the device have now confirmed the nature of the Antikythera mechanism, and discovered several surprising functions. A mere seven hundred light years from Earth, in the constellation Aquarius, a sun-like star is dying. Its last few thousand years have produced the Helix Nebula (NGC 7293), a well studied and nearby example of a Planetary Nebula, typical of this final phase of stellar evolution. Seen from central and northern Asia, the Sun and New Moon set together on January 4, in a partial solar eclipse. Close to its maximum phase, the eclipse is captured near the moment of sunset in this wintry scene from the bank of the Berd River near Novosibirsk, Siberia, Russia. For many Europeans, the Sun and New Moon rose together on January 4 in a partial solar eclipse. Arriving close on the heels of the new year, it was the first of a series of four(!) 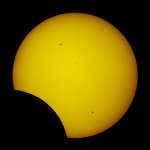 partial solar eclipses due in 2011. Many think it is just a myth. Others think it is true but its cause isn't known. Adventurers pride themselves on having seen it. It's a green flash from the Sun. The truth is the green flash does exist and its cause is well understood. If you can find Orion, you might be able to find the Winter Hexagon. The Winter Hexagon involves some of the brightest stars visible, together forming a large and easily found pattern in the winter sky of Earth's northern hemisphere. Here is what the Earth looks like during a solar eclipse. The shadow of the Moon can be seen darkening part of Earth. This shadow moved across the Earth at nearly 2000 kilometers per hour.